B1092. 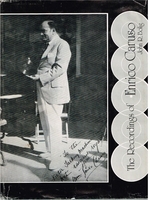 THE RECORDINGS OF ENRICO CARUSO. John R. Bolig. Dover, DE, Eldridge Reeves Johnson Memorial, 1974. 88pp. Very long out-of-print, Final Copy! “Few first-time authors have been granted a more auspicious entrance into the national operatic scene than John R. Bolig received when his THE RECORDINGS OF ENRICO CARUSO was published in 1973. A slim, no-frills volume offset-printed from Bolig's typewritten manuscript and bound by its publisher like a doctoral dissertation, the book quickly earned its young author a place in the limelight surrounding the centennial of Caruso's birth. With that limelight came a ready introduction to the New York operatic scene, courtesy of a number of well-placed Caruso devotees including the late Francis Robinson, then assistant general manager of the Met, who saw to it that Bolig was included on the invitation lists for the centennial galas and tributes. At that time Bolig's ‘day job�, as he liked to call it, was as an administrator in the Delaware state higher-education system. Between that and amassing a collection for the Delaware State Museum about the life and career of Eldridge R. Johnson, founder of the Victor Talking Machine Company, Bolig spent the rest of his free time, such as it was, researching the history of the recording industry in general and the recordings of Caruso in particular.